Need a quick an easy way to make lasagna on a pinch? Try this savory ravioli lasagna...it's quick and the kids will love it! 2. Cook ravioli until soft but still firm to the bite, drain. 3. In a square glass baking dish, spoon the marinara sauce evenly on the bottom of the dish. Place the raviolis in the dish side by side to cover the sauce. Spoon more sauce on to ravioli and spread evenly so they are all slathered in sauce. Sprinkle evenly with shredded mozzarella, then with fresh herbs to taste. 4. Repeat this until the dish is filled to the top. All of the raviolis should be covered in sauce. Sprinkle the top with Parmesan. 5. Bake in the 400 degree oven for 30 minutes or until bubbling and slightly crusty on top. Let cool before serving. 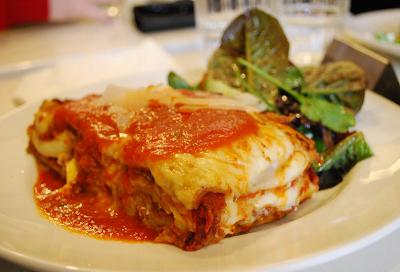 Do you have an alternative to the classic lasagna? Please tell us by emailing us here. This looks great :) Thanks for sharing it!